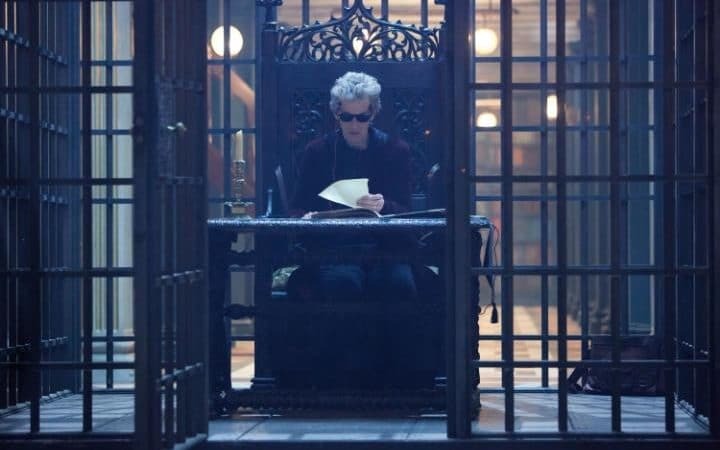 Steven Moffat has taken the opportunity in each of Peter Capaldi’s three years as the Twelfth Doctor to bend expectations and show a Doctor in a much more raw and defenceless state than is usual. After ‘Listen’ explored a mental vulnerability and ‘Heaven Sent’ explored the lengths to which an isolated Doctor would go even when countless versions of himself could not directly benefit from his actions, ‘Extremis’ once more shows a more susceptible Time Lord at the brink of death to set the scene for the first 2017 multi-episode story of Doctor Who. Indeed, without swerving into the sometimes blisteringly chaotic pacing and shifts in location that have defined some of Moffat’s bigger episodes, ‘Extremis’ continues the slower and more deliberate stylings of this year’s offerings to tell what end up being two disparate plot points and bringing them to the point of dovetailing. In doing so, the mystery of the Vault’s occupant is apparently revealed (though the Vault has yet to be opened and someone or something could be there alongside Missy), and ‘Extremis’ confidently delves into a flashback that initially toys with the prospect the Doctor being executed on a planet devoted to execution before quickly turning the tables and casting the Doctor as Missy’s executioner, wonderfully highlighting the very unique relationship these two longtime sometimes-friends and sometimes-rivals share in the process. Although these scenes by themselves form a smaller portion of the story, the reveal of how Nardole came to be in the Doctor’s life is well realized, and Michelle Gomez is sublime throughout, bringing an air of sympathy to her malicious but enticing character and convincingly able to suggest that she just might be capable of good when her life is on the line. Yet it’s the Veritas thread that forms the true backbone of this story, one that brazenly presents the truth about what becomes its biggest plot twist right at the beginning. As impactful as the visual of Nardole disappearing after praying that his assumpions are wrong is, though, Peter Capaldi’s understated delivery to Bill that they and everything around them are fake grounds the entire sequence with a compassion and sense of heartbreak that only this incarnation could so powerfully deliver. At no other point in the programme’s history could a story about ancient sects, random numbers, and a sentient Super Mario who is sick of dying carry such profound weight and anchor such an emotional scene as the Doctor gently tries to break the truth to his companion. Both before and during that revelation, due credit must also be given to Pearl Mackie’s Bill for herself being a grounding influence no matter how strange events around her get, her lack of artificiality as she remains true to herself and demands to be treated as an equal shining through and providing the perfect counterpoint for a story so focused on finding the truth. As a whole, ‘Extremis’ is an immensely satisfying episode that works both as a self-contained story and one that expertly sets the stage for what is to come by deftly looking back to what has already happened. It’s fitting that it should be River Song, or at least Nardole acting as proxy for the Doctor’s departed wife, who reminds the simulacrum Doctor of who he truly is and what he must do despite his non-existence. While the story itself can easily be viewed as a puzzle that links both the depths of religion and science, helped immensely by strong turns from guest stars Cornado Invernizzi as Cardinal Angelo and Laurent Maurel as CERN physicist Nicolas, it very much is also a story about the Doctor truly realizing what it means to be the Doctor. Whether Veritas remains in the virtual world of Extremis or comes back with an explanation of its existence to wreak havoc as the mysterious Monks’ invasion of Earth begins to unfold in reality and whether the notion that the Doctor can somehow borrow energy from his personal future is explored deeper, ‘Extremis’ is a well-paced and powerful episode that represents how well Doctor Who can anchor outlandish concepts with the real world while providing a surprisingly reflective story in its own right.